Visitor “The Subtle Knife” points out that the VP’s office in the West Wing has been repainted blue. Quite a bold choice. A couple apparently crashed the White House state dinner the other night, held in a fantastic tent on the south lawn that I think the Bushes used a couple of times. I don’t typically blog about news events, even as they pertain to the White House, but I just wanted to note a couple of things about the coverage. It’s a slow news day, so anything of national interest is going to make headlines. Even proper party guests don’t get into the White House without being screened for weapons. People who represent a serious security risk would not have gotten in. That was a beautiful dress. I regard this as less a breach of security than a breach of state protocol, but the couple will obviously face some serious questioning, and shrugging it off as a harmless prank isn’t going to cut it. I see a public apology and community service in their future. POV vid of the West wing… from a turkey’s eye view. After taking some time to have a family life earlier this year, Pete Sharkey is hard at work again on 3D models. This time, he is creating a more detailed model of Air Force One than the current one. See it progress on Wingnut’s Workings. Thanks Pete! 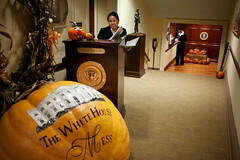 There are some great new photos available on the White House Flickr photostream, including shots of the Halloween decor and photos showing the Oval Office corridor and outer office as well as this great one of the corridor in the ground floor leading to the Navy Mess. I’ve changed the front page to one of the Treaty Room in Taft’s time. Oddly, this is the first time the Treaty Room has served as the front page in all of the 3-and-a-half years since I started the site. Also added a marvelous Halloween photo of the north lawn.